Today’s title comes from the lovely new face of Nene Leakes! I had to rewind my DVR and listen to her say it twice. Fantastical! I concur. Who delivers a baby early without complications? Babies are on top of their mothers bladder, that’s just a fact. No doctor is going to remove a baby just from a little bit of pressure on the bladder. Shut it! Before coming on television she should have had her story together. If she was pregnant before they were married, she should have just said it instead of fronting like she is some southern belle. I have to say, I think I’d like Phaedra a bit more if she stopped trying to act so high saddity. Dumb ho. As for Sheree’s assessment of Apollo giving Phaedra the diaper bag at the party instead of at their house, hello PLANNED! She probably picked it out herself and told him to drop it off. I’m not faded. 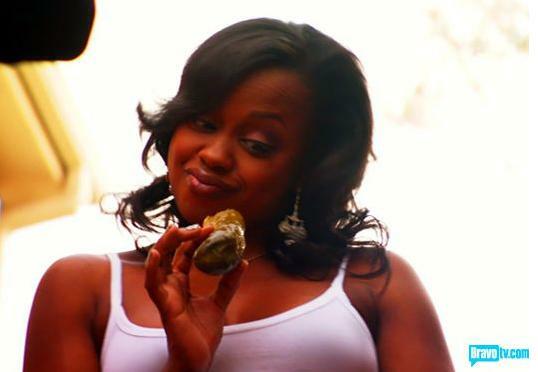 Moving on to Phaedra’s photo shoot earlier in the show – I’m not even going to comment on the pickles vs. southern belle. Those jokes are way too easy and not my style. Speaking of style, did she really need a stylist to put her in a pair of jeans and a white tank top? Let’s be real here, this is another classic example of this lady hamming it up for the cameras. You aren’t classy. Having a stylist doesn’t MAKE you classy and a white tank isn’t something that a friend who wants to be on camera “stylist” puts you in. Word. I swear Sheree has the body I yearn for (minus the not having breasts part). The great thing about her is she’s had it since the show began. She didn’t change her style for the show or try to lose weight for the show…she has always been healthy and fit. I do admire that in her. Too bad she lost her edge =( I used to enjoy making fun of her. It seems she hated the backlash and DID change her personality. That or she grew up overnight. It was nice to see Kandi and Kim interact together while on Kandi’s web-show (anyone ever seen the show?). Of course this was probably written into her contract to give it more play. Whatever. Kim needs some therapy and asap. You were in a cheating relationship. I hate when a woman says she isn’t cheating if he’s the married one. You are cheating yourself fool! I have to give her props though, she sure does put it all out on front street. Love it or hate it, she keeps it real (minus the wig). As for Peter snapping at Nene, she needed to hear it. I don’t know how close they are but apparently they knew each other before the show, so with that said I’m all for it. My heart does go out to Nene. Any relationship is hard and is always going to have their ups and downs. I hope she can get through this for her younger sons sake. As for Cynthia – I’m still utterly bored. Are the producers going to cut her next season or did they threaten her mid-way through the season? Meaning, is she soon to create drama just so she can be invited back for a second season? I guess time will tell. ← The Walking Dead: A new show about Zombies on AMC? I’m not a watcher of this show, but I have to say I get a kick out these recaps. friends of mine were telling me about Phaedra saying that all white people eat only canned food (amongst other ridiculous things.) i would actually kill to see what the contract stipulations are for these women, considering the ridiculous manner in which they act in public. LMAO @ Nene’s quote. The most hilarious part of that episode.